Volunteering abroad on a Medicine placement with Projects Abroad offers an excellent way to gain medical work experience combined with the chance to help people in some of the poorest medical institutions in the developing world. As a Medicine volunteer in Cambodia you will have the opportunity to gain a wide range of medical work experience in a variety of departments. Most Medicine volunteers in Cambodia work in Phnom Penh, in a large State Hospital. We also have placements in a Paediatric Hospital and in an International Private Clinic. The State hospital originally opened in 1960. It was forced to close for 5 years during the Pol Pot regime from 1975 to 1980 and sadly, during this time, many doctors and educated medical professionals were killed. Since reopening the State Hospital has become the largest hospital in Cambodia's capital and admits over 17,000 patients each year. The hospital employs 140 doctors almost 200 nurses. All Medicine volunteers in Cambodia taking part in one of our overseas voluntary work placements must have completed at least one year of medical-related studies or training by the time they join this project, or at least three years to work at the paediatric hospital or private clinic. Each placement is then tailored to your level of experience and interests. We will ask you which departments you would like to specialise in out of the following options: General Medicine, Gynaecology/Maternity, Infectious Diseases, ENT, Obstetrics, Psychiatric ward, Neurology, Pneumology, Oncology, Urology, ICU, Ophtalmology, Stomatology, Emergency (requires at least 6 years medical training) and Surgery (requires at least 3 years medical training). The hospital staff request that you spend a minimum of two weeks in each department. Your supervisor at the hospital, the Director General, will then assign you to work with the specialist doctors within the different departments. We will do our best to place you in your preferred departments, but we can not guarantee all departments will be available all of the time. Your role at the hospital will usually start by being observational and you will shadow the local staff. If you show enthusiasm and initiative and develop a good relationship with the medical staff, you may find that you gain enough trust to be given more to do. As with any job – and especially in the field of medicine - you must prove yourself to be trustworthy before you are given responsibilities. 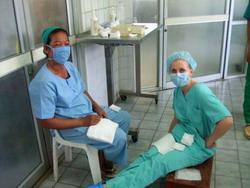 Facilities within the hospital are basic and treatments are sometimes not of the standard we would expect in the West. You should be prepared to see some shocking cases and try not to get emotionally involved with the patients. Normal working hours are from Monday to Friday from 8am to 12pm. Many of the doctors do not work in the afternoons however it is sometimes possible to arrange to return to the hospital from 2pm to 5pm to help the nurses or do extra work with the patients. Some volunteers have even arranged to work the occasional night shift. Many of the doctors speak French rather than English, so if you speak some French this will come in useful. There are usually some English speaking staff or student doctors in each department who can also communicate in English. Dentistry students and graduates can also join us in Cambodia. Dentistry volunteers work in the dentistry department of the State Hospital in Phnom Penh. The department deals with the diagnosis and treatment of a wide range of dental problems as well as the investigation and treatment of mouth disorders and surgical treatment of deformities of the mouth and jaw. As with all medical related placements your role will depend on your level of experience and skill. Showing enthusiasm and initiative and developing a good relationship with the local dentistry staff is essential and may lead to you gaining a more hands-on role. Вы можете ознакомиться с детальной информацией о целях данного проекта здесь: Cambodia Medicine & Healthcare Management Plan.